Airdate: The Michael J. Fox Show, Perception. In January the Universal Channel has a refresh, and here’s what’s in store. newsman Mike Henry decides to return to work on his own terms. Michael J. Fox and Betsy Brandt star as parents of three in this single-camera comedy series. Fox portrays a caring husband dealing with family, career and the challenges of Parkinson’s – all loosely drawn from his real life. Perception sounds a bit like House. A doctor treating patients with serious and weird deseases yet he has a drug addiction problem. Anyway The Micheal J Fox Show is great i remember reading about it earlier in the year and really liked what i read and the promo. However i would have thought it would have been on Seven. I guess it will be eventually. The MJ Fox Show is good, not fantastic but well worth the watch, it grows on you. Just a shame FTA passed on this one, it could have been a nice summer show if they were worried about fast tracking. The US ratings haven’t been very good, but this is the case with most NBC shows over the last few years. Again well worth the watch! Can’t wait for TMJFS! Looks absolutely brilliant! And Perception has taken far too long to return! Damn damn damn!!!!!!!!! 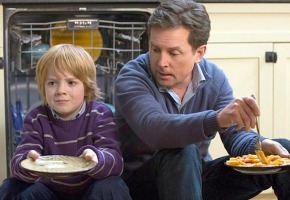 I’ve been so looking forward to the Michael J Fox show, I’ve loved him since Family Ties & Spin City days. Now it’s gone to bloody Foxtel. I had hoped 9 or one of the other channels would get it.